Yesterday the RSPB finally called for Defra to publish the Hen Harrier Recovery Plan. Fantastic news. Martin Harper, RSPB Conservation Director, is to be congratulated on finally making it publically clear that there is indeed a Hen Harrier Recovery Plan, negotiated by Defra with “the shooting industry and conservation groups”, and that the RSPB is currently the only participant vetoing the implementation of the plan. This is a very important development, as it allows everyone to understand the nature of the remaining problem and focus on its resolution. The RSPB have published their list of worries about one element of the 6 point plan; brood management. Fair enough. It is helpful to listen to other people’s worries. For each of these I have explained why they are not worries for me. Brood management is an internationally recognised conservation technique for increasing bird numbers, not reducing them. When the population of breeding hen harriers starts to climb in England (not before) and a hen harrier builds a nest within 10km of an existing hen harrier nest, the chicks (not the adults) will be taken into an aviary for six weeks before being released back into the wild as adults. This will not only ‘protect’ the chicks but should also help restore hen harriers across all suitable hen harrier habitat – not just on grouse moors. Q: What would happen if the recovery trajectory is not being followed and brood management does not secure the recovery demanded? A: Brood management is a conservation tool to increase bird numbers, not to reduce them. It has been shown to work in France and Spain for Montagu’s harriers. The RSPB has no difficulty in using it with other species. At this year’s AGM, the RSPB’s members listened with delight to how brood management was being used in an attempt to save the spoon-billed sandpiper, one of the rarest birds in the world. Taking clutches of eggs from the tiny number of nests left in Asia and transporting them across the world to England, where they were hatched and reared in protective custody before being flown thousands of miles to be released into the wild. A classic case of successful brood management. Will it also work in the UK for hen harriers? Delaying the Recovery Plan will only delay answering this question. Q: How many hen harriers will be tolerated in the wild under a brood management scheme and what happens if that threshold is passed? A: Are we delaying the recovery because we are now worried that there will be too many one day in the future? We have years to think about this. What we need to do is get the number of hen harriers up in England without delay. Q: What happens to the remaining adults (and their broods) on the moors if they lay a replacement clutch or they move to an adjacent estate and lay a clutch? A: The plan would not change. If a second clutch is laid in the same nest (or in a nest within 10km of another), they would be removed to an aviary too. Since this would help increase the hen harrier numbers even faster, it is odd that this is being seen as reason to delay implementing the plan. Hen harriers are ground-nesting birds and the chicks are very vulnerable to predation by foxes, badgers, crows, ravens, goshawks and buzzards. Brood management ensures that if five chicks hatch, five chicks survive. This is in stark contrast to the five chicks that hatched on a Derbyshire grouse moor this year, three of which were killed by predators before they could fly well enough to escape. Q. Where will the aviaries be located to house chicks and what specifications will they need to meet? A: Hen harriers will be kept in aviaries under the same standards of care as legally required for the hundreds of birds of prey already in aviaries and those used by the RSPB for their translocation work. This is certainly no reason to delay the Recovery Plan because we may not need an aviary for years. Should suitable aviaries not be available when required, the hen harriers would just stay where they are on moors. Again, this is not a reason to delay starting the plan. Q. How many harriers will be housed in aviaries as the scheme develops and what is the preferred ratio of natural and housed broods to secure delivery along the population growth trajectory suggested in the draft Action Plan? A: Since this would depend on how fast the hen harrier population recovered, the numbers are not known. Are we suggesting we don’t wish to start because it may all go to plan? Q. What happens when fledglings are released back to their natal moor, or return there from alternative release sites, and cause disturbance to grouse shoots? A: Nothing. Is this a reason to delay the Recovery Plan? Q: What legal mechanism is being considered to allow for the licensing of brood management under the provisions of the EU Birds Directive? Under the Habitats Regulations, why has an appropriate assessment of brood management not been required given that it is likely to operate in Special Protection Areas for which the hen harrier is a qualifying feature? A: Let’s not overcomplicate this. The French and Spanish have been doing this for 20 years. If there is any EU paperwork we still require, let’s just ask them to email it over. There is no reason to delay the plan on this basis. Q: Who decides which nests go into captivity and which don’t, and will there be an appeal process if an estate believes it is being penalised for carrying a brood(s) not taken into captivity? Under what form of regulation will an appeal process take place, who will undertake the appeal, and how long would it last? A: Natural England (NE) is the only organisation in the UK that can authorise conservation measures that involve intervention of wildlife. They issue thousands of ‘licenses’ every year, including to the RSPB. Q: Who will be legally responsible for the harriers in captivity and what will happen in the event of wild harriers becoming ill or dying in captivity? A: If hen harriers are temporarily taken into captivity, Natural England will have to issue a licence. They issue thousands of these things. If they give you a licence, you are responsible. Q: When will a decision be taken to progress with brood management in an area during the nesting period and who will make it? A: This will be detailed in the Natural England licence. Q. Who will provide training for those licensed to keep the birds in captivity and how will they be recruited? A: Exactly as existing licence holders are trained and recruited. Should this present a problem the brood management can’t proceed, but this is no reason to delay starting the plan. Until hen harrier numbers grow we won’t even need to do this. Q: Who will administer, regulate and monitor the scheme and how will this element be funded? A: Natural England will regulate any intervention. If funding needs to be found, as with the spoon-billed sandpiper, you approve the plan and secure funding. Delaying the plan only delays answering this question. Q: If the scheme is deemed legal, why don’t we wait until some recovery of the population, at least until it reaches a point where it causes national economic concerns to grouse moors and where alternative solutions are deemed impracticable, before introducing a trial of brood management? A: The RSPB has spent seven years funding an economic driven grouse moor demonstration at Langholm. No alternatives have yet been shown to work. If an effective alternative is found then that could be adopted. This works in Europe so why not test it here now? If there are no known alternatives, why are we delaying the Recovery Plan any longer? Q. Why won’t there be a requirement for diversionary feeding to be widely attempted before a brood management trial is introduced? A: Diversionary feeding is an existing and important part of the plan. As the RSPB has helped to show, diversionary feeding, on its own, does not work. Q. Why hasn’t Defra considered lump sum compensation to estate owners and workers where harrier numbers reach levels that make management for grouse shooting unprofitable, seeing this as a payment for the production of a public good? A: This question has nothing to do with the brood management scheme. The conflict resolution process aims to achieve more hen harriers alongside economic driven grouse moors. This suggestion fails to achieve that. Q: With disease control leading to increasing red grouse abundance and cessation of population cycles, how will we know when the time is right to impose a brood management scheme, i.e. how will we establish whether the problem is serious given that the current model for assessing impact was developed some years ago? A: This year Aberdeen University published very similar numbers to the ones produced by the GWCT in 1998. Should any new model data be published, that can be accommodated when the plan is reviewed. This is no reason to delay starting now. Q. 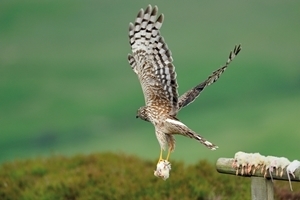 With regional variation in grouse productivity and survival, how will the model for assessing the impact of hen harrier predation be used at different temporal and spatial scales? A: The Recovery Plan is about increasing hen harrier numbers, not grouse numbers. Q: Given that the English population could reach c.340 pairs, how much could a full brood management scheme cost to operate and who will be responsible for paying? A: We don’t know. Unless we start we will never know. Q: How much is the state prepared to contribute to a brood management scheme? A: I expect the funds available from the taxpayer will be about as much as the state contributed to the brood management scheme for spoon-billed sandpipers – nothing. Q: What happens to the scheme in the event of an illegal persecution event on any one of the participating estates? A: The police would be immediately contacted. Is this a reason to delay implementing the Hen Harrier Recovery Plan? The RSPB translocation of white-tailed eagles and red kites continued even when they knew they may be illegally killed – why is it different for hen harriers? Q: What level of public support is there for brood management? A: Has someone suggested that there is public support for delaying the recovery of hen harriers? Did the RSPB delay funding the brood management of spoon-billed sandpipers while considering public support, or did they just get on with it? Perhaps the public are more interested in hearing if it all works. Let’s get on and let them know the results. I dread to think what the public would think about us delaying it much longer. Q: If a scheme is permitted, would Defra consider a scheme for other threatened species that pose an economic disadvantage to individual landowners? A: No idea. Why on earth is a question like this being used to delay the recovery of the hen harrier population? Q: How will the scheme help to tackle the persecution of other raptors, which are being restricted to settling in the uplands by criminal acts? A: The Hen Harrier Recovery Plan is intended to increase hen harrier numbers. Why are we delaying the plan for hen harriers using this type of question to delay the hen harrier plan? A comprehensive response and very compelling case for starting the Joint Hen Harrier Action Plan now, without further delay. Come on Defra and Natural England, let's get started - with or without the RSPB. Andrew, it's good to hear your views above, but it's not clear why you resist hearing the views of the public on brood management - why do you resist the idea of public consultation on this element of the plan? You appear to acknowledge that brood management wouldn't commence for a while (at only four pairs in England, there's clearly no need for brood management at this point). So there's ample time to allow the public to be consulted on brood management. Or is yours the only view that matters? All well reasoned responses......as far as they go to the issue of hen harriers and grouse moors. You clearly point out that brood management can only happen once numbers recover. We have to get there and as it is widely acknowledged that hen harrier numbers on grouse moors are restricted by persecution, the recovery plan must offer respite from that.Your inference that the hen harrier will not recover ground without the plan seems to support that notion.The hen harrier recovery plan should be implemented but it is a sad day for nature conservation when it seems to be held to ransom by the threat of continued illegal activity. And we should not let this be used to divert attention from the persecution of other birds of prey in relation to grouse moors. If the plan is implemented, every effort should be made to stop all persecution of protected birds of prey.